Discussion in 'Infiltrator' started by CuteBeaver, Mar 1, 2015. CuteBeaver here with an interesting little written guide on Camouflage and how to use it in Planetside 2. We often think of camouflage as just something pretty or fun to make our character more memorable. While self expression is very welcomed I personally feel we have really overlooked some of the benefits that camouflage can STILL offer. Creating a one size fits all camouflage guide has become a difficult and very complicated task. I feel at this moment core concepts we are going to cover will not change drastically. However during my teaser I got allot of negative feedback on reddit (Regarding technical limitations when creating MP4's) which I have no control over. Essentially when I created an MP4 using Movie Studio colors are slightly washed out. To maintain accuracy this section of the guide will not include video footage. If you DO want video footage of camo in action, please understand colors, no mater what editor being used are not going to be 100% perfect. I am not going to spend hours upon hours trying to perform color correction, and deal with the negative feedback or accusations for altered video. Even if I were to upload raw shadowplay clips directly to Youtube there would still be anomalies. Any MP4 especially on Youtube is going to be slightly different then what you will see in game. Or even what you create using editing software. Youtube changes the files it uploads to their codex. I have no control over what happens when I upload my clips to youtube. I will also not endorse specific camo for "no good reason". As long as someone actually reads the entire guide they will surely understand the logical reasons behind selecting one camo over another camo. I am not attempting to sell camo for Daybreak, or help someone on player studio profit. I don't know any of the camouflage creators in real life either. Now that that pile of rubbish is dealt with lets begin. Second, lets talk about the reasons why people tend to think camouflage is simply cosmetic, with no real advantage in Planetside 2. Snipers have visible tracers which tend to give away their location. This is especially true when the sniper is skilled and becomes very efficient, someone like Mustarde, who can fire two shots or (possibly more with implants) per breath. As the snipers skill improves their overall concealment level goes down. More shots = more tracers. Cloak does its job offering temporary ambiguity between attacks while sounds echo across the landscape. For a skilled sniper like Mustarde, he has to be mobile in order to avoid being counter-sniped. Or as I like to call it "Wrel cam" also supports this style of play because if the sniper is not using a silencer, a line is drawn on the death screen map to the killers location. So your looking at a situation where success basically gives away your position. There are also implants like awareness which auto spot anyone who damages or kills you unless that player is wearing a silencer. Most players do not like to use silencers because of the damage penalty that shortens the rifles effective range, and the additional bullet drop. Silencers basically change the weapon and most of the time people will not see any large benefits because they are still reliant on mobility to increase their life span rather then the location. Cloak sound advertises your presence. Fortunately we do actually have control over this drawback. Its hard to remember sometimes that you don't "need" to cloak. Lets be honest, sometimes we do it out of habit, however there are certain circumstances where it becomes advantageous not to flash cloak frequently ~ if at all. Tanks almost always equip thermals, aircraft, and those using HS-NV scopes can still see a well dressed warm body. The range on HS-NV is roughly 50 meters, but thankfully HS-NV not as popular of an optic at the present time. The q-spot can also be used to highlight someone using camouflage as well. There are implants you can use which will show you that you have been spotted. The human eye is very adept at picking up movement. Especially if that movement is prolonged, and usually the faster an object is moving, the greater the chance that we notice it. Even someone wearing perfect camouflage will be spotted if they are moving rapidly. To suggest a player stays still 100% of the time and ignores the situation at hand is pure suicide. What I expect is for intelligent usage of camo, and once you are concerned that you are spotted, evasive or aggressive actions on your part occur. If mobility is your preferred style of sniping please understand I agree with the logic behind it. I expect you to use those skills once you are concerned for your safety. I am not attacking something which has proven to be very effective. However I would like to show how its possible to use stationary play along with camouflage to your advantage. In essence give you another card in your deck to use depending on the location and battle. In order to do this properly..... and NOT create a guide designed to get people killed and frustrated, we first had to examine where game mechanics cause Camouflage to fail. In short any type of prolonged movement will ruin your attempts at using camouflage effectively. A problem, whenever I bring up the subject is "unrealistic expectations". People don't understand the game mechanics that are leading to getting found in the first place. They blame camouflage for not working out of ignorance... Or they have this completely bizarre idea that camouflage is for mobility. What makes a GOOD camouflage different from a AMAZING camouflage. How do you get that "Magic" camo which is barely detected even at 20 and 30 meters. With player studio some innovative designs have been added to the game which can really help to conceal you in specific locations. Sometimes these camos will have mutli-purposes, and other times they are best used against a very specific type of background. Unless you enjoy hide sniping primarily - camo's with more varied purposes may be ideal since they are not freely obtainable with certs. Before you purchase a camo, for the sake of camouflage, you should probably understand what makes good camouflage in real life. Cryptic Behavior: Its also worth mentioning player positioning techniques can be used to "mimic" the object, and further conceal the human shape. This is where your personal skill and creativity comes into play. Your looking for colors that are as close as possible to the environment your trying to blend with. AVOID FLAT single colors which do not have any highlights or low-lights. You need to take lighting into account. A single shade of green for example is going to stick out. However a camouflage like Amerish Leaf is a good example of using both highlights, and low-lights for a strong element of background matching. Sadly Amerish Leaf tries to use some disruptive coloration but doesn't pull this off with a huge degree of success. The disruptive pattern is present but is not dark enough to be truely effective at distorting the human shape. Most people only select camouflage which has background matching properties ignoring the other two elements entirely out of ignorance. Most likely the strongest element when selecting good camouflage. The best example is a camo that incorporates portions of dark organic shapes, which hide the body. Disruptive Coloration tricks the eye into seeing false shadows and makes a human form harder to pick out. Most people just overlook these types of camo patterns as "weird" and would think that they would not help them blend into the background because it looks "too dark". While background matching can be effective, as seen with Amerish Leaf. Its totally missing a powerful transformation. Derelict Tech Camo is the best camo for hiding in bushes (For Vanu). It conceals the players body shape making it difficult to determine what is a bush, and what is a human. Often seen in nature when the underbellies of animals are lighter, and the tops are darker. It makes them a bit harder to pick out from a distance. You might be asking.... how does this affect planetside 2? Female character models have a more shapely appearance, and concealing anatomy can help make you less obvious. Some camo's will brighten the bottom or drag shadows across the lower back. Camos that can Counter-shade parts of the females appearance change how our minds identify even the fullest of shapes. Camo is only effective when you are demonstrating cryptic behavior. Generally speaking not standing up is actually very useful when it comes to disguising the human shape. Cryptic behavior is any behavior pattern that maximizes an organism's ability to conceal itself. You will find your creativity and positioning can actually increase your concealment and make you much harder to pick out. Positioning techniques will change for every camo that you use for the intended purpose of camouflage. Some camo will be daytime only. Some will be night time only. During the night and low light conditions, humans become partially color blind. For example a green camo might look more brown and become viable to be used against a tree. You may not initially expect this to happen but indeed some Camo's can change their purpose from day to night. Its important to understand what lighting conditions you can use the camo under. Shadows can be trickly. Each camo has its limits. Should you hide on the shaded side of the tree? Or the light side? If you selected the shaded side of the tree during the day, do you accept the risk someone could be running with NO SHADOWS - and possibly see you more easily at around 40 meters. Is the camo actually good enough to be used under improper lighting conditions? Or should you just stick to where it performs best. In order to mitigate risks and compensate for a potential lack of shadows being seen by the enemy should you hide on the darker spots of the tree? Does the pattern support that? or can you hide anywhere effectively on the tree? All this is going to change for every single type of camouflage that you use. Watch out for high gloss camouflage. Like Forest Ground. The gloss produces different colors on the body making you appear more shapely and this makes the human form easier to spot. It draws attention to the outlines of your body and makes seamless color transitions impossible. During the night, watch out for camos which are too dark. Remember proper background matching requires highlights and low lights. A solid black shape will be less effective then something like "Gambler" against a tree which produces fake highlights to trick the eye. If you choose to stand in direct sunlight, but want a higher vantage point, does your camo allow your waist / midsection to line up with the existing shadows of the tree branches during daylight to hide your faction markings better? Is there any way that the purple Vanu faction markings can be used as Disruptive Coloration, taking advantage of dark markings on the object? For example dark cracks on the rock being used to blend the Vanu Identifiers. Knowing what objects, and parts of your body are most visible when trying to hide snipe can come in handy. For example camo coverage on a Vanu Sniper Rifles is lacking, and if you are trying to hide inside a bush while an enemy is approaching switching to your secondary may be a better option then holding the steel gray accented rifle. As a player approaches the bush most of the time the sniper rifle is going to give you away even if you point it towards the ground. As distance increases between you and the observer the rifle becomes less prominent. At a distance the rifle can be used to mimic a tree branch. The player can also use tree trunks to block thermals, and hide their human shape as well. Thinking about how you appear to enemies takes time to master. Some of my biggest tips came from friends watching me and telling me they can see certain parts of my body. Other times I will go to the test server and practice with a second account. Try and get feedback from people you trust when possible. I think ultimately having the confidence to know the enemy is unlikely to see you because your faction markings are concealed by bushes, trees or rocks can boost your confidence. Using that camo effectively and knowing you don't have to flash cloak (giving away your presence) out of fear allows you to pace your shots, pick high value targets and helps take some of the pressure off. I imagine that all of you will have much fun being creative and finding new hiding spots. I will add videos to this post as I incorporate them into the playlist. These will be tailored to specific hiding locations for each faction. I wish I could have used more video, but the responsible way to do this is using a text guide first to avoid false impressions and keep peoples expectations in line with reality. This screenshot was taken just yesterday. I'm not sure how it came to be, but this magrider right here ended up sitting crewless for like five minutes straight right there out in the open. The majority of my teammates running around didn't seem to notice it at all until it was spotted on the minimap. Awesome job all around!! 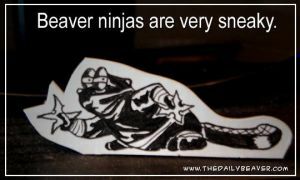 Truly a ninja beaver! Very nice guide well thought out. It seems you put a lot of time into the guide and I hope people can benefit from reading it. Thanks for coming out with another amazing guide. Can never learn enough about infiltrating. But reading this left me with a feeling that to truly get a benefit from camo, one must do a lot of personal testing and research. Obviously this is necessary for people looking to become the top 5%, the best of the best. But is there some sort summarized advice for those who don't want to invest that much effort? 1) Don't use glossy camo. 2) Don't use monotone / solid color camo. (That was the biggest breaker for me. Suddenly, solid black camo for exceptional directives doesn't look attractive). 3) Use a camo with both dark and light spots, preferably that would disrupt the humanoid form with false shadows. 4) Stay stationary until your stealth is compromised. And also, like I said before. Forum guides are nice, but they are not supported, and you can't edit them. Consider getting your own site, or maybe branch off from Mustarde's blog. I could help with the first one, if you need so. "Jawa" as in "Jawarisin"? I'll have to see that. But in all seriousness, t's coming along nicely. It'll most definitely be part of the in-depth cloaker guide series, along with revised versions of my Sniper's Guide, this lovely camo guide, and likely Buccano's "Shadow Blade" guide (if he permits). There is still work to be done, but I think the finished product will help people to understand the class better as a whole, in addition to helping people understand how to use the class in a team-friendly and productive way. Still on the list of things to do: Infiltrating and Psychological Warfare, Mid-Range Scout, and Team Communications, among a few others. Just to add... Since most people do not want to buy SC for the camos, most people will just continue on without it. This can be a problem for using camoflauge. I mostly just take cover in bushes and stuff, but most of the time, my greatest strength is just my enemy's poor situational awareness. Like the picture of a mag above. It's fairly easy those in a bush behind enemy lines and snipe the crap out of people from there. Not a lot of people see the tracers coming from behind. Also, I always find it annoying that somehow my team let an enemy engi jump off a tower and run to our Sundy with mines. WHY DOES NO ONE SHOOT HIM??!?!? "Nope im not here, I'm just a bush, carry on... oh no don't worry this dead body there, no no carry on, i'm just a bush"
I particularly enjoyed the picture with the 5 chicks for the "disturbtive camo". That wasn't something I had thought of before. Got to say I was impressed by the teaser, now I'm going to be inspecting trees a lot D: I had to re-watch that first part 2 times, at first I thought you were cloaked even after they revealed your location. Awww, straight to my heart. Though I can't drop a firecracker in a crater, so I'll have to wait a few days. What I plan on doing is breaking things down based on the location, and showing those camos with a video so people cans see roughly how to use my top 3-4 camos for that object. I will honorably mention a few contenders that showed promise, or maybe I had second thoughts on for a final spot in the top 3 but didn't make the cut. Ultimately while some might have lost for one reason or another they are usually still extreamly good and worth mentioning. I wont spend a great deal of time with honorable mentions but that is useful information to know in case someone already has those camos. It takes a great deal of time to do a guide like this. With trees I had to narrow down 30+ camos, I took several nights and tried to be as objective as possible. I worked 30+ tree camos down to 10 for day, and 10 for night, and then go through every single graphic setting + no shadows to make sure they are all viable. Its neat because sometimes you find camos on closer inspection which have multi purposes or you find out problems with glossy camo which would have originally been in your top 3. Forest ground was in my top 3 until I noticed just how badly it caused your human form to stick out under certain lighting conditions. We all know allot of BR 100 players play on Low / No Shadows for FPS advantages despite having good rigs. So i dont want something that is only going to be helpful on enemies running shadows. If your camo has a liability for enemies running w/o shadows that is something very important you would need to know about. As well as ways to minimize those risks because its always going to have an impact especially during the day. I sorta side stepped the forum issue using a playlist. The link remains updated so long as I add the videos to that playlist. Ultimatly I think understanding how I am coming to select these camos is going to help allot more then just saying "use these 3". Camos always update too, and something new could come out which makes such lists outdated so my goal is more to show something working to boost confidence. Here is a working example, heres what it looks like on low without shadows. You can try and do x y z to help get around that problem. Is it just me, or does the positioning rely solely on not looking at the enemy while hiding? During the entire video he never turns the infiltrator towards the spotter. I would also like to see this camo during movement of the one spotting. It's a lot tougher spotting something while you aren't moving. When you do move, you can stop the two-dimensional view you have of the game and make it 3-d as you see the environment move and suddenly your brain can make distance guesses and spot that something irregular is sticking out somewhere. Additionally, the Vanu have an auto-help with camo due to their dark-purple main colors (As Angry Joe once said: The Vanu specialize in being a ***** to see at night). I would like to see if any of these camo's are even possible in bright blue+yellow that the NC like to carry. Otherwise, it's informative and handy. The solid black directive camo is one of the few that's an exception to this rule, as there are quite often many places where the environment is dark, and the camo helps you blend well versus a camo with lighter patches. -While fighting VS (I've often found the lower BR's will entirely miss me if I act like a VS. Natural, but don't linger. Even some higher BR's take a moment or two to confirm you're not friendly, which is often the advantage I need to escape or kill them). -On Esamir (you easily can be mistaken as a rock in the distance). -On Hossin (due to the overall darkness of the landscapes and the slight environmental aspect of limited visibility). -Fighting NC up close (Either they assume you're VS, or a darker themed TR, making the decision easier for them). -Fighting as NC (I get gunned in the back so often. Thanks guys, I needed a few Saw rounds to the groin ). -Fighting on the upper areas of the Indar sea bed or the brighter areas of amerish. -ANYWHERE out in a sizable open area (Though it's not as bad on rocky flat areas on Esamir and Hossin, but anything shy of a cloak is less than ideal in wide open areas). I find this camo is well suited to a vast majority of areas, so long as the enemy doesn't get a solid look at you. The natural VS colors (or rather, lack there of by comparison) are truly amazing camo, especially at night! Just bumping this to know if CuteBeaver has done some progress on this. Also, is there good armors and helmets for camouflage purpose? Yes, the less colored markings, or metallic accents on a helmet the better. As example: The basic Vanu infiltrator helmet camo coverage is excellent, (covers the entire head) and the only visible teal markings are in the front. This is great since you want to be aware of anyone who potentially sees them. I despise teal colored flare in the back or along the sides of a helmet since those places are where you are most vulnerable. My delay has been caused by problems associated with having caught influenza B, and possibly Whooping cough. Its been 2 months and I am still healing. Unfortunately when someone has a compromised immune system they don't tend to bounce back quickly. I ended up bruising and then cracking a rib from ongoing intense coughing fits. So it will be a while before I am able to voice over any new videos unless the subject is short enough not to irritate me. I'll post this for now, and do the videos later when my health returns. This camo pulled ahead because of my testing regarding LOW GRAPHICS and NO SHADOWS. It also works really well on higher graphics and with shadows. Having this versatility is great since you know the camo will help you regardless of your enemies settings. Indar Highlands V2 is a Daybreak created camo, and has been around for a while. Its perfect for people who use Indar Trees as cover objects while sniping, and is ideal for those who don't/ cannot climb up to the canopy. Best used during daytime, but the lighter colors act as a makeshift highlight, and still offers usage at night time. Previously my number one Daytime pick, Indar Dunes fell to second place because of how it appeared on LOW GRAPHICS and NO SHADOWS. It has a slightly more orange appearance and wasn't as convincing as Highlands under those settings. For the record it still "works" but I am very picky. On better graphic settings Indar Dunes still works as beautifully as it did in my teaser. This camo also doubles as a fantastic "Indar Rock Camo" its already in my top 5 for daytime use. Consider this camo a smart purchase if you are short on Station Cash and want something that works for both Rocks and Trees. Bladestar is at the opposite end of the spectrum. A player running on higher graphics settings is going to have nearly an impossible time picking out someone using Bladestar. It mimics the spotted pattern on the tree and uses disruptive coloration to disguise the human form to an astonishing degree. The best way to use this camo that I have found is in the canopy or while on the tree trunk itself. Positioning is everything with Bladestar, and someone using higher settings with this camo has to know where the "spots" on lower settings are located. To find them look for the location where the pattern radiates outward in a spiral and place yourself in the middle of it. Understand that "filler" between "spots/spirals" doesn't exist on lower settings so you really need to be hiding on the correct location for this to be effective. Bladestar also does much better when hiding on the shaded side of the trees during the day. The reason for this is due to its slightly greenish color. Its not a true 100% color match, however when you throw shadows into the picture it does perfectly match them instead. In the Canopy its slightly greenish color makes blending with leaves easier as well. My favorite location to use this camo is in the "armpits" of trees. You place your back towards the trunk from an elevated position. (Of course making sure your on a darker spiral location) and go to town sniping or using your crossbow. The branches usually provide natural shade in those locations as well so you don't have to worry about sunlight as much. A general point: Its always better to remain in the peripheral vision of your enemies. This is where Bladestar performs best anyway. Hands down this is my favorite camo for hide sniping, especially during the night. If you can climb indar trees this camo is a must have. Basecam is a daytime only camo.... Thats the only reason it lost to Bladestar (which is night and day) At night time Basecam becomes too dark for Indar Trees, and makes you appear like a human silhouette. Basecam does well against the shaded side of trees during the day, or the canopy. Basecam also has that "magic" factor going for it, allowing for concealment at closer ranges against opponents using higher settings. Its not as convincing at lower settings unfortunately because the moment you take the shadows out of the picture this camo becomes more noticable. However with the shadows on, its too bloody convincing and I really need to list this as an honorable mention. Its hands down easier to use then bladestar and less dependent on positioning against the tree. I love this camo for hiding at the base of the tree, as well as elevated positions (in much the same way as Bladestar). It's darker appearance is ideal for mimicking tree branches. To do this you simply stand where the leaves begin on the branches. Your body will look like a little twig / off-shooting branch mixed in with the leaves and its incredibly effective to stand on an outstretched limb shooting downwards in this manner and have people just overlook you. I find for this purpose its more effective then Bladestar since you don't care about the leaves beyond the fact they just make your mimicry more convincing. Essentially your tricking people into just ignoring you and assuming your a tree branch rather then attempting to blend in with the leaves. Assumptions can be powerful when it comes to being overlooked. Again the only reason this camo lost out to Bladestar was because its only usable during the day. I'd still highly recommend this one. Aww didn't know you were sick. Rest well, we can wait for more news, that's just a game. Health first.